Our guide to Knoxville will help you find the best budget hotels in Knoxville Tennessee. Thanks to its location on the Tennessee River, it has served as a vital industrial port and is still the site of the Tennessee Valley Authority, which was formed in 1933. The city is also home to the University of Tennessee. Each fall, legions of orange-clad football fans cheer on the Volunteers at Neyland Stadium. As for the city itself, Knoxville offers plenty of cultural and historical attractions. Be sure to visit the Old City that surrounds Central and Jackson and the World's Fair Park, which was the site of the 1982 World's Fair. Other attractions include the Ramsey and Mabry-Hazen houses, both of which are listed on the National Historic Register. The Great Smoky Mountains National Park is only forty miles away. There are tons of great budget hotels in the city of Knoxville, our city guide will help you find the best budget hotels. You may have a hard time deciding what to do in Knoxville, but we make your decision easy. 10206 Parkside Dr, (888) 897-0084 - Candlewood Suites Knoxville is a budget hotel / motel / resort located in Knoxville TN. 10935 Turkey Dr, (865) 777-0375 - Homewood Suites Knoxville is a budget hotel / motel / resort located in Knoxville TN. 10955 Turkey Creek Rd, (865) 966-8888 - SpringHill Suites Knoxville at Turkey Creek is a budget hotel / motel / resort located in Knoxville TN. 11320 Outlet Dr, (865) 966-7500 - Vista Inn & Suites is a budget hotel / motel / resort located in Knoxville TN. 144 Merchant Dr, (865) 247-0222 - MainStay Suites is a budget hotel / motel / resort located in Knoxville TN. 1551 Cracker Barrel Ln, (865) 971-4033 - Fairfield Inn Knoxville East is a budget hotel / motel / resort located in Knoxville TN. 1700 Winston Rd, (865) 694-4178 - Extended Stay America is a budget hotel / motel / resort located in Knoxville TN. 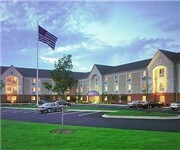 205 Langley Pl, (865) 690-6742 - Residence Inn By Marriott is a budget hotel / motel / resort located in Knoxville TN. 208 Market Pl Blvd, (865) 690-0034 - Comfort Inn & Suites is a budget hotel / motel / resort located in Knoxville TN. 216 Peregrine Way, (865) 690-6511 - Hilton Garden Inn is a budget hotel / motel / resort located in Knoxville TN. 2841 Alcoa Hwy, (865) 577-6604 - Scottish Inn is a budget hotel / motel / resort located in Knoxville TN. 323 N Cedar Bluff Rd, (865) 934-1182 - Budget Inn is a budget hotel / motel / resort located in Knoxville TN. 420 N Peters Rd, (865) 539-0058 - Best Western Cedar Bluff Inn is a budget hotel / motel / resort located in Knoxville TN. 5317 Pratt Rd, (865) 687-9922 - Best Western Knoxville Suites is a budget hotel / motel / resort located in Knoxville TN. There are plenty more budget hotels in Knoxville. See all budget hotels in Knoxville Tennessee.